"A Texas Historical Marker dedicated to F. W. Flato will be unveiled in Flatonia on Saturday, May 20th at 1pm. It will be in front of the home that once was the Flato family home at 830 Penn Street, Flatonia. The granddaughter of the people who now own the home applied for and got an official marker from the Texas Historical Commission. They would love to have some Flatos in attendance for the ceremony, so I am sending this out to you and hope that you will let other Flato descendants know about it. When I receive the official notification, I will forward that to you as well, but thought I would get this much out in case you want to mark your calendar." A slide show of the event was created and distributed to those in the Amsler family that attended this event. Enclosed are three DVDs of slide show covering the Texas Historical Marker dedication ceremony for F. W, Flato on May 20, 2017. One DVD is for you and the museum. Please pass ones labeled “Ana Allcia Estrada” and “Estrada family” and relay our appreciation for their work and hospitality in supporting this event. The DVD for the Estrada family has a special caption at the end of the slide show expressing our appreciation for the family’s hospitality. We thank you for informing and keeping us posted on this event. It was very enjoyable and time well spent. Within the slide show we tried to give credit to all who worked on making this event successful. The only person I was unable to identify was the lady to right of the Mayor and Ana during the Mayor’s part in the program. We thank you also for all the time and effort that you invested in this project and we always enjoy our visits to your museum. We are very impressed with Ana Alicia Estrada, who worked many hours to have this event come to fruition. We are also thankful for the Estrada family and the demonstration of their hospitality as we expressed in the Estrada family’s copy of the DVD. (361) 594-2928 -- at Werner's Steakhouse. Tommy, and his daughter and grandson, Lori and Tanner Amsler and Eric's family were those who attended. We had fun with Tommy’s iphone video selfie that we produced a slide show with him as the primary character. Werner's has worked out well in past years, reservation had to be changed from second to first Saturday as Werners had no record of request for second Saturday. Last year we had a fantastic presentation on family genealogy. Hopefully we will have a dozen or so attending as we stated we would have 15. We would like to hear from you if you plan to be there. on 101 E. North Main. 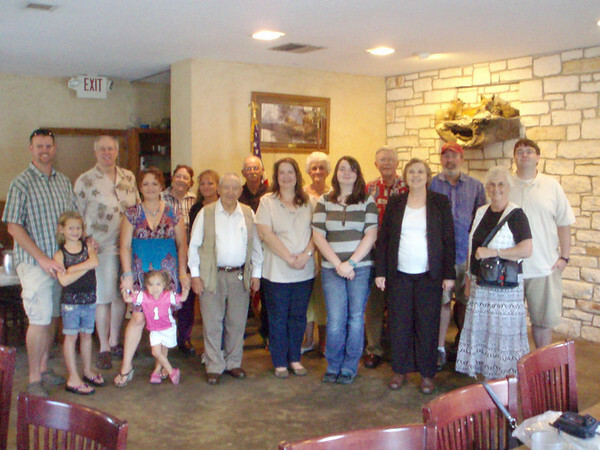 Their son Phil says that William Tell Amsler was a cattle man and worked in Oklahoma Territory as a youth for Charles Flato who at that time had thousands of head of cattle on open range..."
June 14, 2014 Family gathering for Lunch in Shiner at Werners Restrauant John Guittard presented a Power Point slide show illustrating extended family DNA . Charles Guittard presented slide show on Ancestry DNA from Sammy's tests and Sammy later enrolled in family name module of Ancestry.com showing links in Europe. 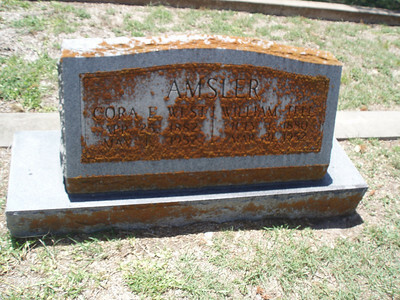 Amslers.com web site provides links to family gatherings as far back as 1965 where we had a picnic near San Antonio Zoo. Check here >>review images 1965 and you will see four photos at a 1965 picnic taken shortly after Larie and I married. We also show album of photos from a picnic in 1996, which was at a pavillion in Shiner. In addition to building web sites such as our church web site fvcofc.com (and studying how to create better web pages) and photography, my other hobby is golf as some of you may be aware. So we keep busy in retirement. 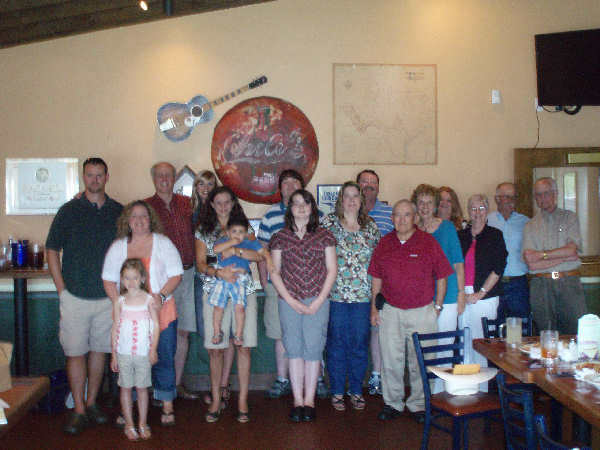 Due to sickness we were unable to attend family gathering in Shiner at Werners Restrauant. We understand that John Guittard presented a Power Point slide slow that we hope to be able to include images linked within this page. We anticipate that this page will be updated with photos and comments from those who attended that gathering. 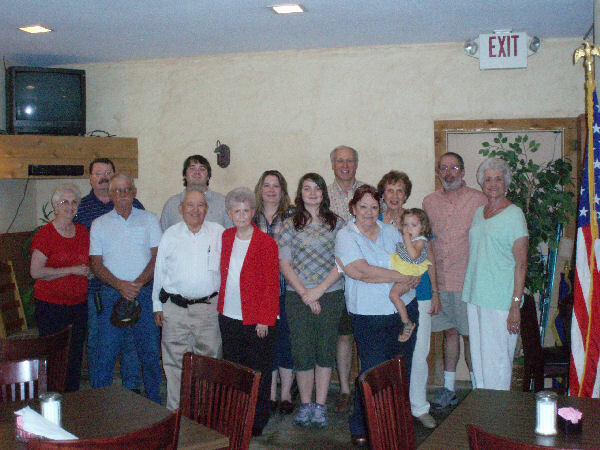 On Thanksgiving day 2011 Tommy and I visited and discussed the date of June 16, 2012 (Third Saturday in June) for 2012 family gathering in Shiner at Weiner's restaurant. This group image is linked with other photos that you can browse from Smugmug web site. 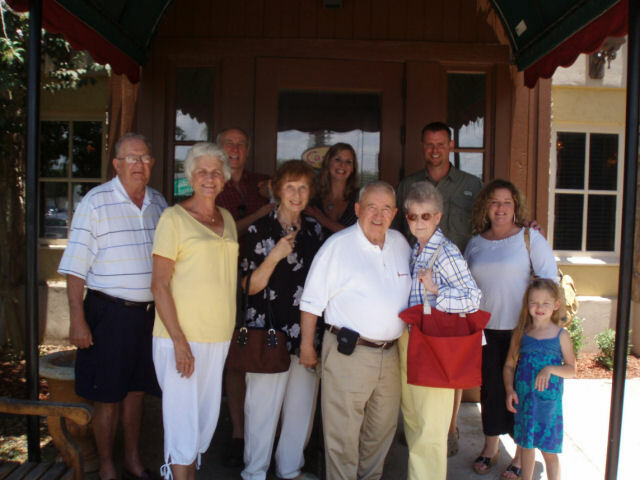 Everyone met at Werner's Restaurant. and enjoyed themselves. Gayle Minear had several displays showing photos of her trip to Switzerland in mid May of this year. We arranged for a visit to the museum in Flatonia with a lady by the name of Judy at 2 pm so we ordered lunnch order lunch about 11:40. Sherrie, Bob and Debbie's family, The Minears, and Sammy and Larie visited the museum and afterward all but the Minear family visited the gravesite where W. T. Amsler/Cora Amsler are burried along with W.T. Amsler's parents, Louis Philip Amsler and Sophia Flato Amsler, our great grandparents. I was three years old when Sophia Flato Amsler passed on. A card mailed in 1910 is shown on amslers web site I believe that from within extracts of the book on Sophia Flato Amsler page, that Sophia Flato Amsler on page 59 of Amslers of Austin's Colony is the same person as the photo on the picture postcard (Mother of Papa (W. T. Amsler). Sophia Flato Amsler's husband, as the book relates, was L. P. Amsler who was my grandfather's father. Compare the photo on the postcard with the Flato's 50th Anniversary photo, which shows Sophia Flato Amsler in both photos. My best recollection is that Dad, (David West Amsler) mentioned "dadamoma" referring to his dad's mother. If you have any thoughts on the comparison, please let me know. My email address is at bottom of home page for http://amslers.com . Lately we recognize that the photos published in "Amslers of Austin's Colony" represent a treasure trove of photos provided by many families. In today's generations we are able to scan those images and post on the web which preserves and enables succeeding generations to look back on photos of our ancestors which in fact a family album on a web site, smugmug. If you have any old photos that you are willing to loan please bring them with you. We are able to scan same and post to the web site or upload them to Smugmug photo sharing web site for your family to viewYour photos will be returned as soon as they are scanned. In some family gatherings we are inspired to add to amslers.com site. This time it was from two books loaned by Debbie Atherton, daughter of Henry Amsler, who was one of my cousins.These books were "The Cat Spring Story" and Century of Agricultural Progres 1856-1956. Both of these books were published by Cat Spring Agricultural Society. 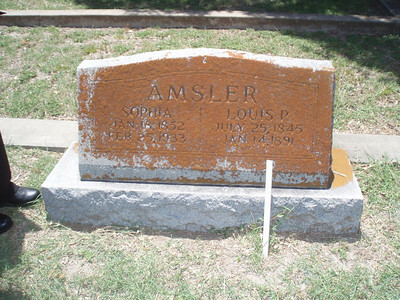 In addition we decided to attempt a chronological account of my grandfather's (W. T. Amsler) Father (Louis Philip Amsler) and mother (Sophia Flato Amsler). With that in mind, the following box illustrates additions to amslers.com web site in 2011. [Sophia Flato Amsler] link to a chronological page of Sophia Flato Amsler images using sequence of 4 photos extracted from the book. Louis Philip Amsler. chronological sequence in the life of Louis Philip Amsler. At bottom of the page is paragraph describing places where Louis Philip Amsler and Sophia Flato Amsler lived. We have charted places and likely dates and will post when we can create the web page format to do so. If you have time to view the "photos to movie album,"
We are working on further editing of the following notes, but have decided to post these drafted notes of family gathering June 11, 2011 and return later for editing. Notes: Larie and I departed from Austin at 8:46 and arrived in Shiner about 10:40 and met Bob right off. Then Tom and Kathryn, and the rest of the family including Gayle Minear and her son Dean. Dean had visited the original town were Carl Conrad Amsler left to immigrate to the United States and eventually settled in Cat Spring in Austin's Colony in 1834. Dean Minear displayed most interesting large prints of his trip to home town of Carl Conrad Amsler in Switzerland. Debra (Amsler)Atheron loaned two books of interest that she found on an internet site, The Cat Spring Story, Cat Spring Agricultural Society and Century of Agricultural Progress 1856-1956.. I have on loan from Debra, Cat Spring Agricultural Society book, to gather additional material for the amslers.com web site. Werniers steakhouse was most accommodating and one of the waitresses took a range of family photos. The meal and service was fantastic. We arranged for special group tour of Shiner Museum and we found a Shiner history book describing Charlie Amsler, druggist in Shiner in years past. Virginia Helweb, Assistant Curator of Edwin Wolters Memorial Museum opened the graciously opened the museum for our family gathering and we found many interesting artifacts of times past, including a book, Shiner - The First Hundred Years 1887-1987 where we managed to obtain copy of story related to Charles Amsler who had a drug store in Shiner. From the Museum, Larie and I had to return to Austin, leaving Shiner about 2:30 and by 4:30 after 8 miles on the toll road 130 we turned west on Palmer lane on the last leg home. Larie and I immensely enjoyed the family gathering in Shiner. In a check off list of names from last year's gathering we asked about the week preferred for next year and comments were 2nd or 3rd weekend. Since 3rd Weekend is on Father's day it appears most are in agreement on the second Saturday in June, which is the date we are planning for 2012. We appear to be in agreement to meet in Flatonia for 2012 Debra has an interest in considering Cat Spring for 2013. So, Lord Willing, maybe we can plan on Cat Spring for 2013. A few years back we met in Columbus and drove to Cat Spring as Columbus restaurant offered a section of the dining room for us. Debra mentioned Carols, but in checking their web site it appears that Carols serve only evening meals. I remember when our group drove to Cat Spring from Columbus that Carols was closed in early afternoon. If anyone can find a nearby place to meet near Cat Spring, let us know. Hempstead is 25 miles from Cat Spring and Columbus is 38 miles. Sealy is only 12 miles. Tony's Family Restaurant looks interesting and prices are reasonable. Looks like a great place to eat when viewing its web site, that is if you are not on a diet.. : ) We surveyed numerous places on the web and there are a many choices in Sealy. May when the time comes we can find a restaurant that will furnish a separate room for us. However that may be difficult with only a dozen people. while we are in Flatonia. I am not sure who else is buried there, but I suspect that some of the Flato family graves may be found there. C Amsler, C Amsler jr, M Amsler, F. amsler. I believe that to be Fitz Amsler. "M" could be Marcus? also veterans of the wars for Texas Independence and for Freedom from Oppression. 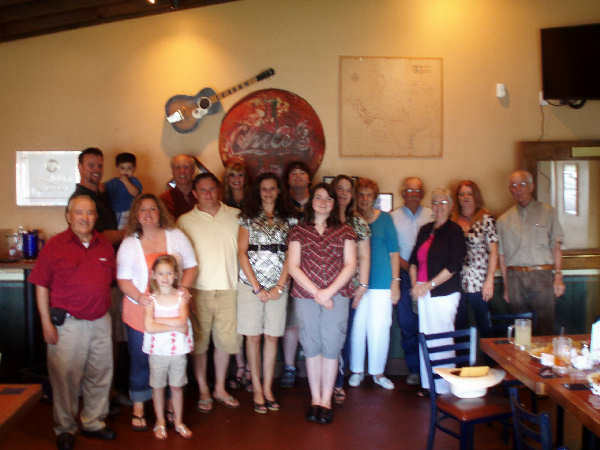 Amsler family reunion for 2010 attended by about 18 on Saturday June 26th. at Chilis, 5004 N.Navarro, Victoria, Texas. Let's see, on the first row, left to right are Sammy Amsler, Courtney and Reilly Amsler, Eric's wife and daughter, Debra (Henry's daughter), Lori Amsler then Debra,. behind Debra is her daughter, then Kathryn Amsler and Bob Amsler, Sherry Amsler, and her daughter, Rebecca Shaw and extreme right is Philip Guittard. (This photo also included Debra's husband immediately behind her) . Note: We are preparing to ship the Amsler book off for digitizing as on PDF document that will enable quick searches within the book itself. Another advantage of having the book in PDF format is that it enables printing of any page or pages. We understand we do not have a copyright problem unless we were selling the dvds. So, family members can also duplicate the DVD to pass on to other family members. Houston Library and one or two other libraries. I (Sammy) contacted the Library of Congress to ask if the book had been digitized as Google is working on digitizing out of print books. But, since the response was that this had not yet been done, I found a company that scans and digitizes books. When the DVD's are done I will send one to each one who signed the sign in sheet at Chilies. If you did not sign the sheet, send me e-mail at on the amslers.com home page. This page's link is at bottom of this page. Back row from left to right is Tommy Amsler and his daughter and son. Front row from left to right is Buddy and Gayle Minear, Kathryn Amsler, Sammy and Larie Amsler, Courtney and Reilly Amsler, Eric's wife and daughter.